Angela Merkel has said Germany 'takes total responsibility for crimes committed' by the Nazis in Greece. The 64-year-old chancellor, who is in Athens for a two-day visit, said Germany was 'aware of our historical responsibility' and 'how much suffering' it had caused Greece during the Second World War. Her comments came as Greece told her it had grounds to pursue a legal claim for billions of euros in damages for the Nazi occupation. Tensions linger over wartime reparations with Berlin arguing the issue was settled in 1960 in a deal with several European governments. 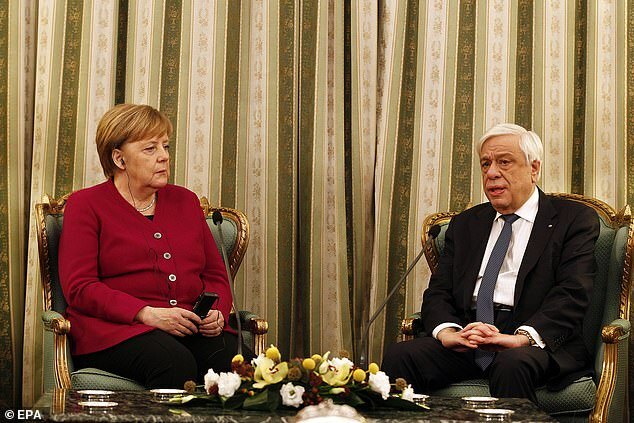 But the Greek president Prokopis Pavlopoulos raised the issue anew with Merkel, during her visit today. 'As Greeks, we consider these demands legally active and (can be) judicially pursued and should be solved in the competent European forum, judicial forum,' Pavlopoulos told Merkel during a short meeting. World War Two reparations resurfaced as an emotional issue during Greece's 2010-18 period of bailouts when austerity-hit Greeks, evoking past injustices, blamed their biggest creditor Germany for painful cuts associated with three international bailouts. Germany has apologised for Nazi-era crimes during the war but has said it is not willing to discuss reparations. It has denied owing anything to Greece for World War Two since it paid Athens 115 million deutschmarks in 1960. 'We are aware of our historical responsibility, we know how much suffering Germany caused Greece during the era of National Socialism so the lesson for us is to do everything we can to ensure good relations with Greece and to support each other for the benefit of both countries,' Merkel said. Hitler's forces occupied Greece in 1941-1944 and extracted a so-called 'occupation loan' used to help finance its campaign in North Africa. Runaway inflation followed, and tens of thousands of people starved to death. Greece was forced to hand over 476 million reichmarks, which Greek officials have estimated at 6-10 billion euros.